I was using permanent markers to work on a project over the weekend (more on that later). Over the course of the afternoon I got so fed up with hunting for markers in various drawers and old coffee cups (you know the ones), that I halted the project for ten minutes to create a marker caddy. I know, sounds nerdy. Marker Caddy. But it’s actually pretty handy. To make it, I just took an empty shoe box and some toilet paper tubes cut to the same height as the box, then stuck them into the box together standing up. No glue, no nothing. They stay up fine on their own and I like that they can move a little to accommodate the pens, pencils and markers that will be coming in and out over the years to come. Well gosh, don’t I feel handy. Great idea! Do you drink V8? 🙂 Because I feel like I should hit myself, “why didn’t I think of that”. Oh well, I’m sure glad you thought of it & shared it! Thank You! Great idea! Thanks- I started making one last night! I have 3 kids and this will be great for them because they always lose their markers and crayons!! I love this idea! So simple to make, thank you. The things you can find online and so simple. Thank you for sharing. Thanks! Plastic frozen juice jars may work also. I have been told not to use TP rolls at school due to slight traces of germs on them due to where ithey are meant to be used. How about paper towels rolls, then??? That would work just fine. Cardboard tubes from any purpose. The quantity will depend on the size of the box. love it..am going to do it..I made magazine holders out of cereal boxes.the instructions were inside the lid of honeycomb cereal..very neat and sturdy for the kids magazines in my middle play room..
Instruction inside the box? Those honeycomb folks know what we like! Looks nice! Now I can do a lot with my shoe boxes.Thanks for the idea. Buy do all those markers work? so clever but simple. LOVE this. I have lots of markers/colored pencils but I’m thinking this would be a cool idea for my mother in law who paints…keep her brushes in it as well. brilliant Peaches, keep those ideas coming! Now if you could just help me with a jumbo version to organize all my stuff, that would be great! Pvc pipe? There are lots of sizes and they’re really sturdy! That looks marvelous. But, what brand of shoes come in this box? I feel like it would look a tad bit ghetto if I used any of the shoeboxes I currently have. 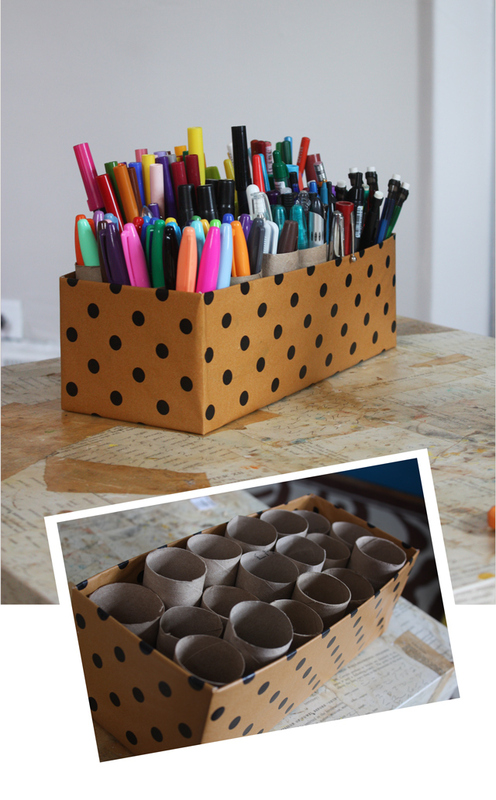 A great way to organize all those markers! They will “keep” longer and also write & draw bettr if you store them points down. Nail the shoe box to the wall then put in holders… horizontal storage! Or hang from a peg board. No extra holes in the walls. Oooo — good point. I have a whole drawer devoted to crayons and pastels that could use some organization. This would be great for the 3,000,000 crayons in our home right now! Smart idea! Brilliant! I just pinned it! Right? I am thinking of swapping out the cardboard for something else to use in the kitchen for utensils…. what a great idea. I featured it on my blog. Thanks for sharing the idea. Oh my!!! thank you! I have ALOT of makers, and this is a great idea! Thank you so much! I am a site coordinator for an elementary school extended day program run by the Deluca YMCA in Central FL. This is a GREAT idea for all their markers and colored pencils as well as paint brushes. I am going to make several of them and have the kiddies help me decorate them! a frugal and useful idea like this = win! Just made my own version of this. I found a small shoebox that fit 12 toilet paper tubes perfectly in it. I wrapped the outside of the shoebox with purple polka dot wrapping paper that I got at Michaels for $1! This link leads to a page that says, this blog has been removed. FYI: My class and I determined that placing markers upright with the writing tips down seems to make them last longer. You could do this for makeup brushes, just on a smaller scale Pencils, scissors, tubes of glue, etc. All kinds of different things for a classroom.. This will be great for organizing my locker!